Datrium, the leader in Hybrid Cloud Infrastructure, today announced Datrium CloudShift, the first SaaS-based DR orchestration service for VMware to combine radically simple operation, low recovery point objectives (RPO), low AWS cloud cost, and end-to-end readiness assurance. The combination of Datrium's single data stack design, which is inclusive of both primary and backup data, together with its SaaS platform for hybrid clouds, ensures enterprises can finally handle the challenge plaguing most real or tested disaster recovery (DR) events: predictable success. 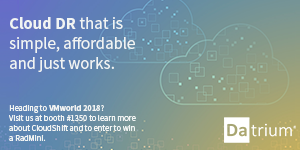 Datrium will demonstrate CloudShift at the VMworld 2018 U.S., Aug. 26-30, Booth #1350. Enterprises are continually seeking new economic models for IT practices, including public cloud leverage. However, due to data volume constraints created by on-premises to cloud communications, few large organizations embrace cloud-based DR due to bandwidth/latency limitations or costs. This is especially the case when using primary infrastructure replication. While modern backup products claim reduced bandwidth and cloud DR storage costs, backups are intrusive, and their restore points are typically too far apart for DR SLAs. Above either, DR orchestration software requires ongoing multi-vendor compatibility and software maintenance, leading to complexity and frequent failures in DR tests. Datrium CloudShift revolutionizes hybrid cloud DR infrastructure by focusing on Datrium's single data stack and providing simple, SaaS-based operation, combining low RPO intervals with low cloud cost. Vendor finger-pointing is eliminated, software is always up to date, and end-to-end resource health checks assure success. CloudShift will support on-demand hybrid cloud as well as on-premise-only configurations. "Enterprises spend millions of dollars on disaster recovery and for what? DR infrastructure that works, at best, half the time? That is insane," said Tim Page, CEO of Datrium. "CloudShift not only makes Cloud-based DR simple and affordable, but does so in such a way that organizations can actually recover from a disaster when necessary." CloudShift is a SaaS-based service, eliminating maintenance of dedicated software for DR orchestration. CloudShift provides a single console for resources and runbooks, and is virtual machine- (VM) centric so there are no intermediate artifacts such as LUNs to wrangle. The service is also deeply integrated with Datrium DVX, with its converged primary and backup data stack for on-premise and public cloud data centers. Integration with DVX means there are no multi-vendor activity handoffs, separate consoles, software stack maintenance schedules and data transformations to verify. Both Cloud DVX and CloudShift are extensions of Datrium's SaaS platform and leverage AWS's serverless approach to simplify end-user operations. In Cloud DR, there have long been two conflicting choices. Organizations optimizing for low RPO, for example primary storage with metro clustering, are burdened with high resource costs. Those optimizing for low cloud cost, for example using backup-driven methods, have to settle for lengthy RPO intervals. CloudShift offers the best of both, supporting RPOs that are minutes apart with no performance impact, while also reducing cloud cost since the DVX stores all data copies with all the cost optimizations of a backup system. During nominal data center operations, the only costs incurred for Cloud DR are for globally deduplicated and compressed VM data in S3 using the Cloud DVX service. Datrium is partnering with VMware to leverage VMware Cloud on AWS for Elastic Cloud Compute (EC2). Resources in VMware Cloud on AWS may be consumed on-demand for the duration of a test or actual DR event, enabling true pay-per-use economics. "At Sonoma County, we provide IT services to first responders as we did during the devastating fires last year," said Stuart Lewallen, data center team lead, Sonoma County.​ "​The simplicity of DVX in our data center and ​in the ​cloud has been a phenomenal improvement compared to our previous solution​. 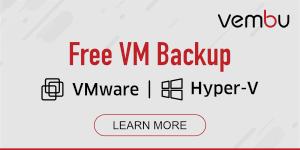 Cloud DVX gives us economical offsite backup, and we intend to adopt CloudShift​​ for a simple, cost effective way to ensure that we will be ready for the next disaster and all our critical services will be available when they're needed most." Datrium DVX is a hybrid cloud infrastructure platform that converges primary and backup data, and already provides blockchain-like data verification multiple times per day to ensure integrity. This is extended with CloudShift, where the DR plan is continuously checked for compliance across the entire stack to ensure that protected VMs, desired snapshot data and target resources remain valid and ready for failover/failback. Most other products are either orchestration-only or backup-based, leaving transition points and multi-vendor adaptors to be maintained and tested separately. With Datrium CloudShift and VMware Cloud on AWS, enterprises can avoid virtual machine conversion risk between vSphere and AWS VMs. "VMware Cloud on AWS provides customers a seamlessly integrated hybrid cloud offering that gives customers the SDDC experience from the leader in private cloud, running on the leading public cloud provider, AWS," said Kristen Edwards, director, Technology Alliance Partner Program, VMware. "Solutions such as Datrium CloudShift enable IT teams to reduce cost, increase efficiency, and create operational consistency across cloud environments. We're excited to work with partners such as Datrium to enhance native VMware Cloud on AWS capabilities and empower customers with flexibility and choice in solutions that can drive business value." Datrium CloudShift will be available in the first half of 2019.